David Cameron is expected to use his first conference speech as Tory leader to resist calls for more detailed policies and a pledge to cut taxes. Mr Cameron will say the Conservatives must lay a "solid foundation" of principles before detailing policies. A party review group will report soon on the tax question and is expected to call for cuts. 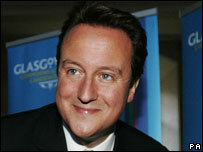 However, Mr Cameron feels a pledge to reduce taxes this long before an election may be seen as reckless. The chairman of the Conservatives' policy review, Oliver Letwin, suggested that a Tory government would not rush to cut taxes. "Nobody... can predict what the effect of reducing a particular tax will be, how quickly, how much, the revenue will rise from the behaviour that people engage in as a result of the tax reduction," he told the BBC's Straight Talk programme. "We have to ensure that we first get our books into order and then of course we do hope to gain supply side-effects ...i.e. people actually behaving differently and making more money and growing faster. "I don't ever see us as putting economic stability at risk by making promises about tax cuts until we know we can prudently fulfil them." Tim Montgomerie, former chief of staff under one of the Tories' previous leaders, Ian Duncan Smith, said tax rates remained one of the key issues Mr Cameron needed to address. He said: "I think Conservatives see a lot of the good that the Thatcher years did is slowly being undone. "British tax levels are now higher than Germany's. If we're going to compete as an economy we have to cut taxes. "People are willing to give David Cameron the benefit of the doubt for the moment, but hopefully next year we will see a beginning of signs of a commitment to lower taxation."